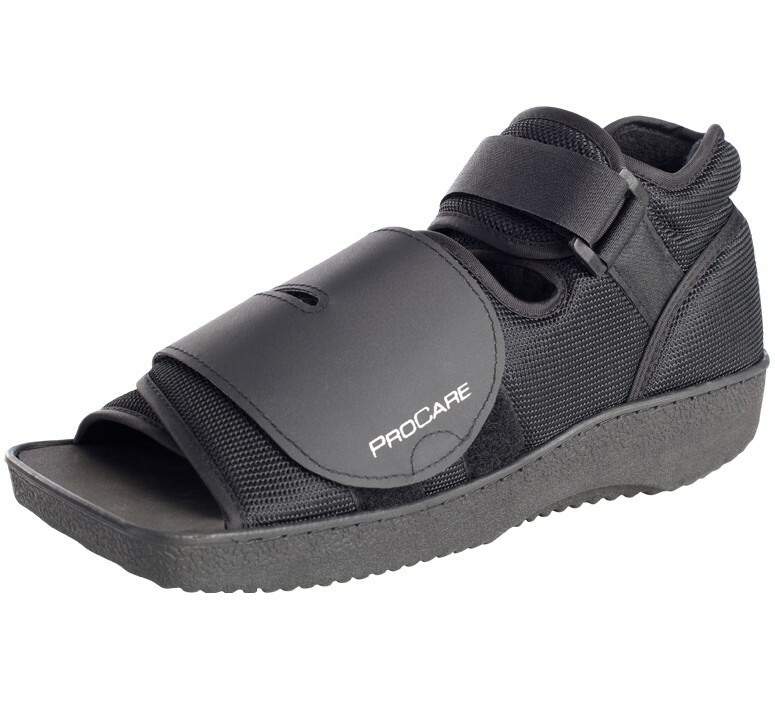 The ProCare Squared Toe Post-Op Shoe allows dressing to be kept clean and toes dry, providing more protection following post-operative procedures and forefoot trauma. The square toe design acts as a bumper and provides additional room and comfort for the patient. The shoe also features high ankle strapping that maintains foot in proper location and a rigid rocker sole for ease of ambulation and pressure reduction. The universal style fits male or female; right or left. Can you machine wash and dry this shoe? I have a ruptured plantar fascia that I'm trying to keep immobilized. Does this shoe have a rigid sole that will keep the toes from bending and keep the heel from coming much off the ground? I'm looking for a rigid solution that keeps the foot from flexing while walking. How tall is the shoe? I can not find any shoe for my left food so I can walk normally. The shoe's sole measures about 4cm at its heighest. An option if you are concerned about your gate is the ProCare Evenup Shoe Balancer. This product will add about 2 cm in height to your shoe. This amount added to the sole of a tennis shoe would make it equal to a DonJoy/Aircast/Procare walking boot which is about 2 inches. Can I remove the foam on the bottom of the shoe. I need to wear my orthotic at all times. Yes the foam insole is removable. I have to wear post op shoe on both feet for several months. I cannot get a firm closure on my right foot because I cannot see the velcro that the top strap attatches too. And I live by myself. Any suggestions. Contact your Area Representative, they may have suggestions for you. See the link below to find your Representative. I have Pro Care Squared Toe Post-Op Shoe, is this shoe waterproof? If not is it ok if it gets wet? The ProCare Squared Toe Post-Op Shoe is water resistant, so it is ok to get it wet. You just have to make sure that you dry it completely before putting it back on. I will recommend this product to others!